My dad has an iPhone4, and he has been busying himself searching for suitable videos that he thinks Bubbles would enjoy or benefit from. Therefore, when I was introduced to a newly launched mobile application Letter Buddies AlphaBooks, the first thing that came into my mind was to ask my Dad to download it for use on the days she's at their place. Bubbles at 20 months can currently only recognise the letters A and B although she can recite the entire Alphabet. She will point out these 2 letters when she sees them, and sometimes, when she 'reads' aloud, she will simply say A, B, C, A, B etc etc while pointing to the words in her books. (very entertaining to watch, by the way) Needless to say, I was interested to see what this App can do and happy for a complimentary download. 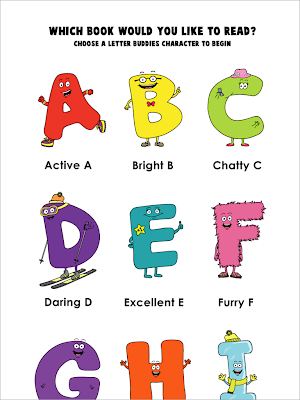 AlphaBooks contains 24 books, one for each letter of the alphabet (letters x,y,z are combined). It is developed by Cavallo Media, launched by a husband and wife team who have over 8 years of experience developing educational materials for school markets in the US and Canada. Their intention is to use their experiences to create applications that will help young children become strong, independent readers. The fact that this App is created by educators was a big plus for me. There is a big part of me that takes comfort in 'leaving it to the experts'! The App is created for kids aged 2-6 who are learning foundational vocabulary and starting to grasp simple sentence structures neccessary for becoming independent readers. So, what was our experience like with the App? When introduced to Bubbles, she was rather captivated. It is on a iPhone after all! That, plus the colourful images and familiar letters that could talk made it even more entertaining. I really like the personification of the letters, and Bubbles is at a stage where something like that is particularly compelling. She already imagines her toys taking on human feelings like hunger, happiness and pain, so having letters come alive really interested her. Another feature of the App that caught my attention was that photos are used to illustrate objects. 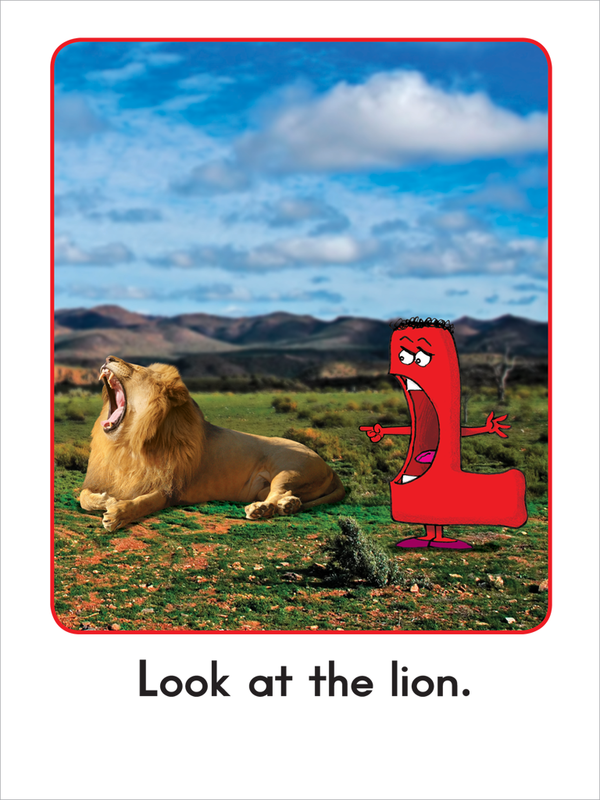 See this photo of a Lion below as an example. 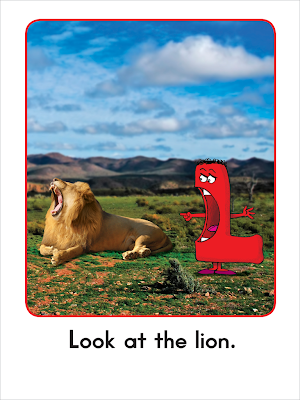 I like it that Bubbles gets to see what a real Lion looks like, as opposed to viewing an illustrated version. The photos are wonderfully clear too, which is great. The App is fuss-free and simple to use, and one only needs to 'open' a book by selecting a letter. The pages are turned by simple swipes, which Bubbles could manage fairly well on her own. The creators also built in predictable sentence structures with simple repetitions that I felt would help a child gain confidence as he/she learns. I've noticed that Bubbles liked this in other books we've read, so I believe this feature must have been intentionally designed. I was pretty conscious that this App, being created in the US, uses American terms. Eg. 'Airplane' as opposed to the British 'Aeroplane'. The accent of the narration is also an American one, as expected of course. However, living in Singapore where most of us are brought up on a diet of multiple English accents and vocabulary, I didn't find this particularly disturbing, just something to note and highlight to Bubbles if neccesary. As of now, she already uses 'Airplane and 'Aeroplane' interchangeably thanks to books that we own from various origins. One thing missing from the App which I would have appreciated was to have the letters read phonetically as well. I have been told that the Singapore school system now teaches kids the Alphabet that way, and some schools even teach the singing of the Alphabet song in the phonetic way! In fact, when we went pre-school shopping, one school principal told us specifically not to teach Bubbles the Alphabet as it will confuse her when phonics are introduced in school. Too late, I groaned! Nevertheless, I personally feel it is alright to teach her both! I would find it too weird if she can't tell me the names of letters and only say them phonetically. It is too early to say if this App would advance Bubbles' recognition of letters of course. I do however think that this is a well-designed App which is a result of the creators' clear intentions to create one that is easily assessible and meaningfully educational. Thanks! Gonna download it now! Wow, McDonalds must be an important word to him!! hee. Learning that way is very creative! I don't actually remember learning phonics! Or maybe I just didn't know that's what it is call then. Ooh! Hope R likes it! This looks like a great app! Gonna go download it, thanks for sharing! I didn't learn phonics either and didn't bother teaching my boys too, though all preschools teach phonics these days. I stuck to whole word approach with my boys which worked great! So don't worry about confusing her even if you teach her the letter names. The real confusion usually lies in the different methods used to teach phonics, e.g. 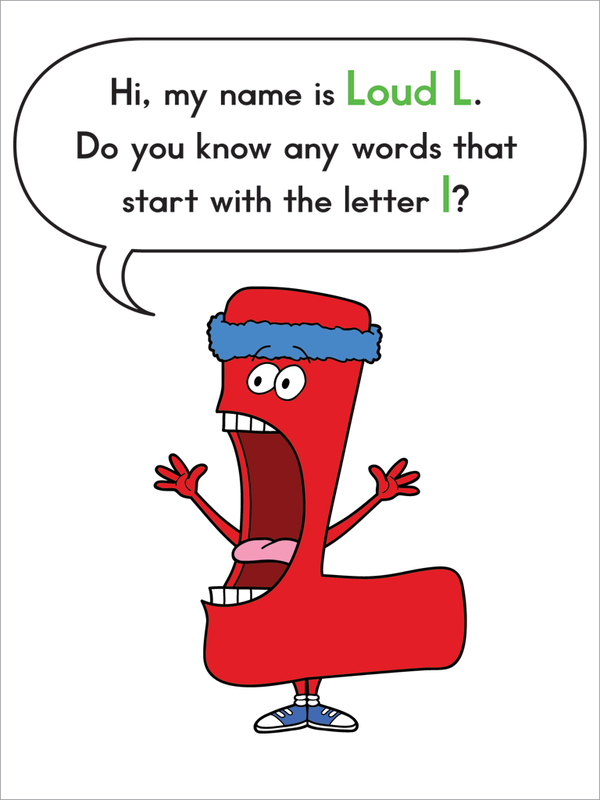 Letterland vs. Zoophonics. Just keep up with the reading and point out the letters whenever you see them will help strengthen her recognition for sure. For now, the iPad is an occasional treat and the iPhone is reserved for difficult moments in public! Thanks for leaving a note! I too am like you! Recently at a restaurant we noticed that every other kid had an iPad or an iPhone propped in front of them. Our (poor?) Bubbles had a bunch of crayons and drawing paper, with a stash of stickers on standby =P We have introduced her to The Wiggles and Barney though and she knows she is only allowed to watch them once on weekends and only when Daddy turns it on for her. (I for the life of me can't figure out the DVD player which is probably a good thing). She loves the music and attempts to follow the actions or shout out what comes next. I'm itching for an iPad because of the great apps out there but the Dad has said a firm 'no'. Books, he says. Books. Ah well, the iPhone will have to do for now - but always under supervision!